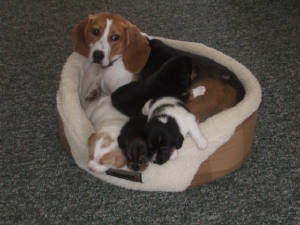 On Jan 21/09 Dixie gave birth to four lovely little pups! With mom being a purebred beagle and dad a really cute/smallish collie cross these pups should stay on the smaller side when finished growing. Pups are located one hour west of Ottawa and three hours east of Toronto. See links along the top of this page for individual puppy pages. Call 613 259 9165 to enquire.